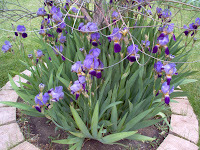 My oldest son is very happy with the results of his efforts with our irises. This is the second year of having them in the ground and they have turned out beautifully!! 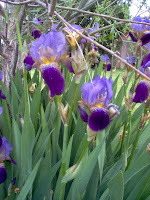 This is a very easy care perennial flower, that he highly recommends. He is inspired to transplant some of them to the backyard after they finish blooming. There are a couple of lone white blooms, that I think he is going to cull out and put in back. Michael might be only 22 months old, but he definitely can express his opinions, so mommy is helping him with his contribution to the blogging world. As you can see Michael loves his little swing. He can stay in this for hours... 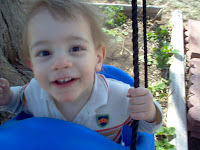 He feels secure in the swing and can go just as high as he would like at the moment. He highly recommends this for a frugal family with a big tree!!! 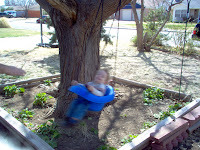 We obtained this as a gift from his Grandma Newhouse at a local hardware store for about $10 and he gets to swing on this at his Grandma's home (p.s. the hardware for hanging, was from some spare hooks that my husband had around the house). We have included a link for purchasing through Amazon in the sidebar, if you would like.